The Washington Post reports that the announcement came this morning. Kate's not quite 12 weeks along yet, but they were forced to release the news early yet again, because she's suffering from another bout of Hyperemesis Gravidarum. You'll rarely catch me expressing deep, sincere sympathy for a public figure sitting so pretty (she can pay people for that), but you've got to feel bad for the woman. She must be absolutely miserable. She's being treated privately at the palace, but it's not looking great for her upcoming public engagements. And in fact, she was due to leave for Malta, on her first solo state trip, in just a couple of weeks. Sorry, Malta! Can you make do with, uh (rifles through sack of royals) Prince Andrew? No? What if we put him in a very lovely wig? Frankly, magic is just what the campaign for the Union has lacked. That's made the referendum an unequal fight, because the nationalist-led case for independence has emotion, myth and magic to spare. Alex Salmond is succeeding in part because he's telling a stirring story of Scotland as a better country alone. The No campaign has failed to counter that with its own story of shared history. 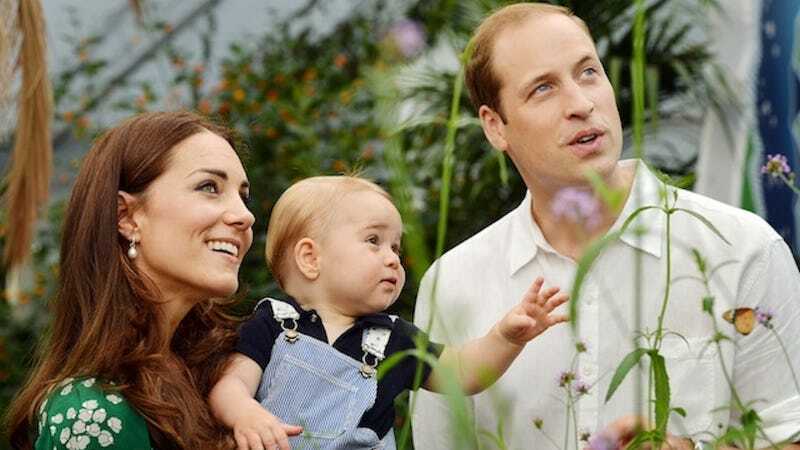 A Royal baby is part of that story, and – if Prince George is any guide – a damned cute part at that. If Scotland votes no because of a royal baby I think William Wallace will rise from his grave to haunt the Highlands for all eternity. He's probably just pleased the tabs have something new to focus on, besides his love life.